Connection flexible connection hoses G⅜"
GROHE AquaGuide - Allows you to adjust the aerator easily - as you wish the flow. GROHE EcoJoy® - Water-saving technology that also saves you money. GROHE QuickFix Plus® - For easy shower rail installation. GROHE SilkMove® cartridge - Smooth control comes from superior cartridge technology. GROHE StarLight® - High shine chrome coating makes cleaning easy. 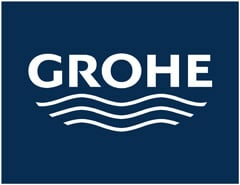 An stylish single-lever tap at an amazing price – German engineered by GROHE! Crafted with its distinctive curved medium high spout, the GROHE Essence Single-lever basin mixer in Brushed Hard Graphite with pop-up waste looks perfect in any cool and contemporary bathroom or cloakroom. 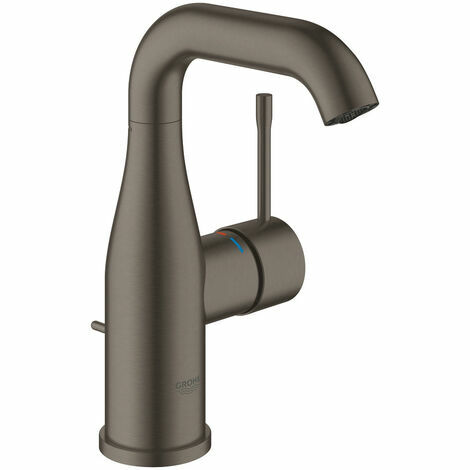 Packed with GROHE technology, it is a delight to operate. The control of water is precise and effortless thanks to the GROHE SilkMove ceramic cartridge. GROHE EcoJoy technology limits water flow to 5.7 l/m – saving water and money. It even has an adjustable swivel range for total cleaning control – lock the spout in place at 0?, restrict the movement to less than 150? or enjoy the flexibility of the full 360?. You can even set the angle of the AquaGuide aerator to suit the contours of your basin to avoid spills and splashes. And using the GROHE QuickFix Plus system cuts the fitting time for the the one-hole installation by up to 50%! A desirable blend of form and function, this monoblock complements all the other products in the Brushed Hard Graphite range such as the GROHE Essence Single-lever bath mixer.